It's been fifteen years since the "Wereld van Diagonaal" (The World of Diagonal) was started by JOKE MENSSINK. 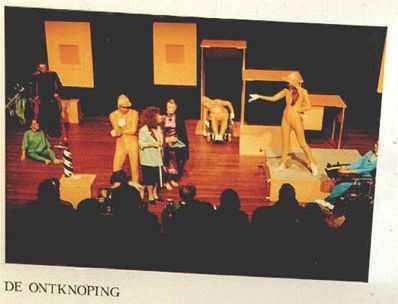 After getting acquainted nearly ten years ago, MARLIES VAN DE VONDERVOORT (actress) and JOKE MENSSINK (director/producer) staged several theater productions with actors who carried a physical disability. At first, all the attention was focused on giving meaning to living with a disability in daily life, but we gradually discovered that using an actor's disability as an asset on stage could add much more to the final performance. 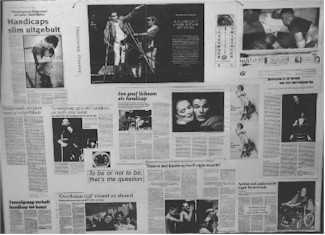 Thus, working together with a number of physically challenged actors, specific theatrical devices and techniques were developed which centralized disabilities as a theatrical benefit. Taking up such a strong position is one thing, but putting it into practice is another and requires continuity. Little by little, the actors of Diagonaal started to change. They began to change not only their attitude towards their disability, but they also started to look at different ways of mastering their physical shape and movements. Different bodies can be inspiring; that's the starting point inside "The World of Diagonal." We view disability as both a property and an inspiring quality. On this basis, we want to develop a new trend in today's world of theater. In 1991, all Diagonaal's activities were consolidated into a foundation. The aim of the foundation was redefined in 1996: to stimulate, develop and expand theatrical and creative opportunities for people with a physical disability related to all the performing arts. Today, after more then 10 plays our audience and critics do not deny our artistic talents, and as evidence of this, we are receiving major new projects. In short: if the world's ready for us, we're ready for the world.